Prince Henry, Duke of Cumberland and Strathearn (Henry Frederick; 7 November 1745 – 18 September 1790) was the sixth child and fourth son of Frederick, Prince of Wales, and Princess Augusta of Saxe-Gotha, and a younger brother of George III. His 1771 marriage to a commoner against the King's wishes prompted the Royal Marriages Act of 1772 . Henry (right) with his brother William Henry, from a family group portrait of 1751. Prince Henry of Wales was born on 7 November 1745 at Leicester House, London, to Frederick, Prince of Wales, son of George II and Caroline of Ansbach, and his wife The Princess of Wales. He was christened at Leicester House twenty-three days later. On 22 October 1766, just prior to his twenty-first birthday, the prince was created Duke of Cumberland and Strathearn and Earl of Dublin. On 4 March 1767, the Duke of Cumberland allegedly married Olive Wilmot (later Mrs Payne), a commoner, in a secret ceremony. There reportedly was one child, Olivia Wilmot (1772–1834), from this relationship, though the duke's paternity was never proven, and Olivia Wilmot was accused of forging the evidence. A landscape painter and novelist, Olivia Wilmot married John Thomas Serres (1759–1825) and later, controversially, assumed the title of "Princess Olivia of Cumberland". Cumberland's mistresses included Ann Elliot who had been an actress before another had taken her off the stage. Cumberland set her up in a house in Greek Street in Soho where she died after an illness in 1769. Cumberland arranged for her burial and memorial and gave a large sum to her estate. 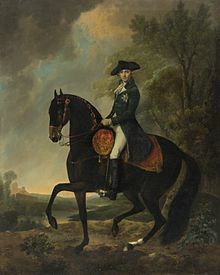 In 1769, the Duke of Cumberland was sued by Lord Grosvenor for "criminal conversation" (that is, adultery) after the Duke and Lady Grosvenor were discovered in flagrante delicto. Lord Grosvenor was awarded damages of £10,000, which together with costs amounted to an award of £13,000 (equivalent to £1,770,000 in 2018). In 1768, at the fairly late age of 22, the Duke entered the Royal Navy as a midshipman and was sent to Corsica in HMS Venus. However, he returned in September when the ship was recalled following the French invasion of the Corsican Republic. He was promoted to Rear-Admiral the following year and Vice-Admiral in 1770. On 2 October 1771 the Duke married Anne Horton (1743–1808), daughter of Irish peer and British MP Simon Luttrell, and the widow of Christopher Horton of Catton Hall. 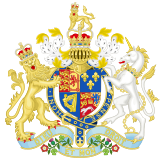 The marriage caused a rift with the King, who considered it a mismatch, and was the catalyst for the Royal Marriages Act 1772, which forbade any descendant of George II to marry without the monarch's permission. There were no children from this marriage. The marriage between Anne Horton and the Duke of Cumberland was described as a "conquest at Brighthelmstone" (now Brighton) by Mrs. Horton, "who", Horace Walpole says, "had for many months been dallying with his passion, till she had fixed him to more serious views than he had intended." Anne was however generally thought one of the great beauties of the age, and Thomas Gainsborough painted her several times. In 1775, the Duke established the Cumberland Fleet, which would later become the Royal Thames Yacht Club. He was promoted vice-admiral of the White in 1776, admiral of the Blue in 1778, and admiral of the White in 1782, though he was forbidden from assuming any command. The Duke was also instrumental in the development of Brighton as a popular resort. He had first visited in 1771, and in 1783, the Prince of Wales visited his uncle there. The Duke of Cumberland died in London on 18 September 1790. His widow died in 1808. The prince's full style, as recited by Garter King of Arms at his funeral, was the "Most High, Most Mighty and Illustrious Prince Henry Frederick, Duke of Cumberland and Strathearn, Earl of Dublin, Knight of the Most Noble Order of the Garter". Henry was granted use of the arms of the kingdom, differenced by a label argent of five points, the centre bearing a cross gules, the other points each bearing a fleur-de-lys azure. Henry Churchyard "Royal Genealogies, Part 10"
Sam Sloan "Big Combined Family Trees (pafg733)"
^ Stella Tillyard (2010). A Royal Affair: George III and His Troublesome Siblings. Random House. pp. 169–175. ISBN 1-4090-1769-9. ^ Walpole, Horace. Memoirs and Portraits, 244. ^ "No. 11637". The London Gazette. 3–6 February 1776. p. 1. ^ "No. 11844". The London Gazette. 27–31 January 1778. p. 2. ^ "No. 12286". The London Gazette. 9–13 April 1782. p. 2. ^ "No. 13241". The London Gazette. 2 October 1790. p. 598. ^ Genealogie ascendante jusqu'au quatrieme degre inclusivement de tous les Rois et Princes de maisons souveraines de l'Europe actuellement vivans [Genealogy up to the fourth degree inclusive of all the Kings and Princes of sovereign houses of Europe currently living] (in French). Bourdeaux: Frederic Guillaume Birnstiel. 1768. p. 4. This page was last edited on 12 April 2019, at 17:08 (UTC).